Storage Cabinets for Commercial and Industrial Applications - In Stock! These premium storage cabinets provide secure storage for almost any storage requirement. Secure valuables easily in commercial and industrial storage environments. 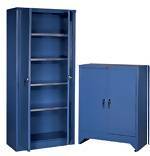 These storage cabinets are all welded with superior hinge and lock systems for durability and years of use.